The fact that Ilios Steryannis is a drummer may account for his being drawn not only to complex rhythmic pulses and time signatures. 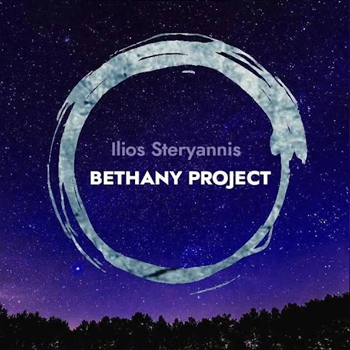 However being able to execute his intricate rhythmic patterns that he has written into the music of the Bethany Project album suggests that Mr. Steryannis leans more towards the “painterly” side of his business – the business of drumming, that is. His sticks may as well be artists-brushes, for instance, and the skin of his battery of drums his canvas. And while he is relatively non-intrusive, it’s clear that he is positioned in this ensemble as a percussion colourist who directs proceedings not by dictating time signatures, but rather drawing attention to the soundscapes that he has created in this enterprising presentation. If this is an introduction to Mr. Steryannis’ work, then clearly he is a musician with wide open ears and one who is agape at the immensity of the sonic universe before him. His response has been to take every rhythmic impulse top heart. His music, as a result, is whip smart, unpredictable and open to crazy ideas that are all integrated into the well-formed and rather mature album. Yet his style remains deceptive, his limpid, euphonious sound artfully leavens his logical but nonetheless oblique and unpredictable melodic thinking – even when he is writing things with harmonic changes that have been used before. “Keep The Change” is a song the harmonic architecture of which is mirrored on John Coltrane’s “Giant Steps”, but it has also been reshaped to mirror the drummer’s own mind combined with the imaginative use of his wrists and forearms to coax a different tone out of his instrument. Being based in Toronto and right in the middle of a thriving music scene with a slew of virtuoso and worldly-wise musicians to draw from Mr. Steryannis has made the best use of this by working with the best musicians available. Perhaps the master-stroke, however, was to co-opt the prodigious Eric St. Laurent to produce and shape the sound of this music. As a result Mr. Steryannis and Eric St. Laurent have schemed to produce an album that takes Jazz to heart while grinding its precepts into producing a fine mix of world music that is full of the earthy rumblings of East Africa, the high and mighty parabolic ululations of Mediterranean music, blended seamlessly with influences as far removed as India is from the Southern-most reaches of the US – all with the majestic wheezing of the accordion and the throaty bellow of the baritone saxophone together with the keening wail of the alto saxophone, the elemental twang of the guitar, uplifted with the heaving rumble of bass, percussion and drums. But more than being a showcase for how flexible a writer he is, Mr. Steryannis’ music is a complex meditation on the interaction between visceral humanity and musical reality, described in eleven wonderful songs with ample breathing space for the voice of each musician to shine, and meld in with the rest of members of this wonderful and truly global ensemble.